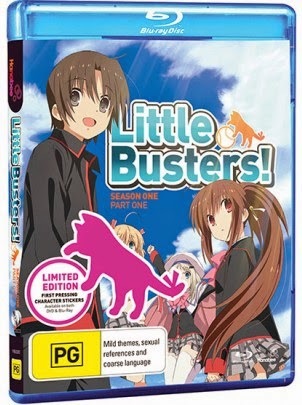 Little Busters Season One Part One is the first half of the first season of a show called "Little Busters" (not to sound like a "Krang" there where I end a sentence with the same wording I used to start a sentence). 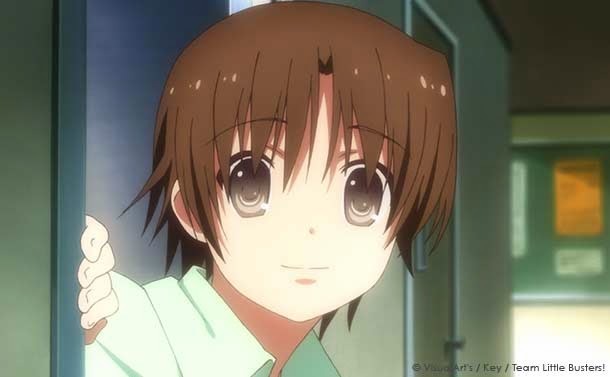 The show is about a high-school student named Kyousuke Natsume who returns to school after searching all over Japan for a job but was unsuccessful. Once he is back he reunites with all his childhood friends: Riki Naoe (the straight man of the group), Rin Natsume (Kyousuke's younger sister who is a bit shy), Masato Inohara (a dumb guy that always thinks of his muscles), and Kengo Miyazawa (A guy who's good with a kendo stick and is always getting into fights with Masato just for fun). Together the group of friends are known as the "Little Busters", a group that will remind you of the old television show "The Little Rascals (1923 - 1942, 1994)"... You'll understand once you watch the show. After Kyousuke's welcoming home party he announces that he wants to start up a baseball team for reasons that doesn't make sense to anyone else but him. They come across two problems right away and those problems are: They aren't very good at it and they need nine members to start one up and as you can see they are down a few players. Now they must find students that are willing to join their team before they can play ball. I wonder how this will turn out? (Click "Read More" to read the full review). If you are expecting to enjoy this show because of the sports then you should best stay away from this show as it's 85% school drama with only 15% of the show having them to do anything with playing the good old American past time. 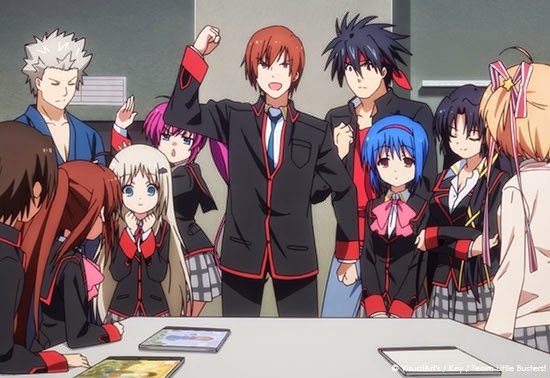 The show does set itself up to be a sports show with the characters on the look for new club members but they also have to have story arcs of two to three episodes of us getting to know the future members of the Little Busters. The drama is actually pretty good with stories that will keep you watching the show. 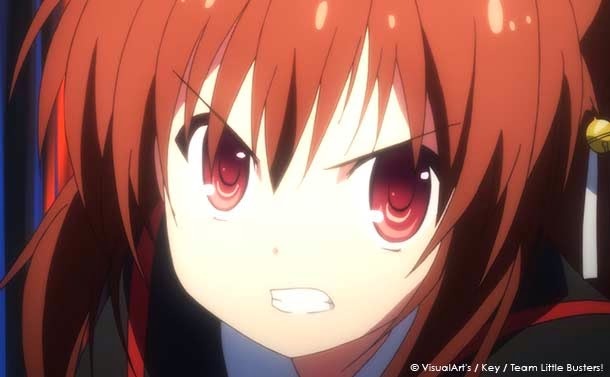 There are some parts in the drama scenes that do annoy me though as it can get very melodramatic to the point where I say "Seriously..." so the drama while good it is far from being perfect. The comedy in this show is pretty slapstick mainly relying on random jokes involving random items thrown at them and puns. While that may sound bad it actually is pretty funny and surprisingly not overused. Characters in this show are very charming and cute but they can also ve serious without me thinking that they are completely different characters. I also liked the interaction between the characters in this one as despite how cartoony the show can get I found their relationship to have a very natural feeling that made me feel warm on the inside. 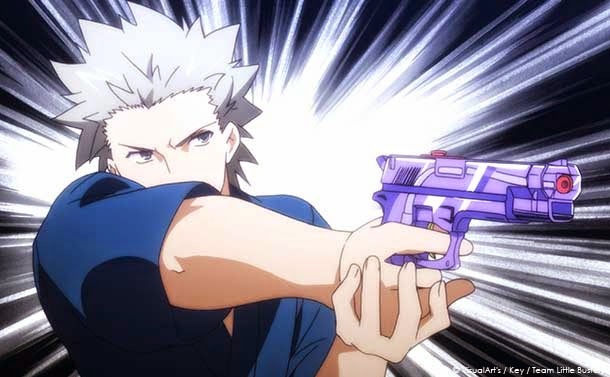 A problem I have is with the structure of the show as it can't decide on what genre it wants to be as one episode it can be a straight up comedy and then the next one can be a straight up serious faced drama and then change again to a straight up horror or sci-fi show. The clashing can lead to confusion for the viewers. There's also a plot twist that happens in the show at the end of this volume and it has me somewhat dreading watching the second volume as I have no idea where they can go with it and it'll be such a shame to see this show jump the shark mid-way during it's first season. While I did like the artwork I also spotted some moments where the character models looked rather odd. One problem with the character modeling is with their clothing as some spots you will see a character with an undone button and the next shot is them with that button done up only to cut to them again with that button undone again. Another problem I have is with the female cast skirts' (this may sound perverted here) as they are very short to the point where you should see (ahem) underpants but no mater what happens their skirts always conveniently cover up something. I'm not saying this to sound perverted but instead to complain about how that's not how clothing works. My final complaint is when the characters are in their sports clothing and how the art is very inconsistent with the character models. Sometimes they have very cubical shaped bodies like if they were robots and then the next shot would be a much more appropriate shape for a body. Background designs are very nice to look at but there's nothing that will make you go "oohh wow". I liked the English dub with this one, it worked well with the characters and their personality although it is far from being perfect and they probably could've done a better job in some scenes to add some extra charm. The soundtrack is alright with some nice rock tunes but there's nothing all that special that makes it stand out as well. The special features section on this release is pretty small (or you could even say... Little) with text-less opening and closing sequences. They weren't bad with some very nice looking visuals and audio that mixed together very well. If you are lucky to find the first print edition of this set then you will find another little extra feature inside the case as both the DVD and Blu-Ray versions come with some very nice stickers of the characters from the visual novel this series is based on. I personally like them a bunch and they will look good stuck on a note book, fridge, or car. Overall this was a very decent drama series although I am worried about the direction the show is taking but we will cross that bridge when we get to it. As for this volume I do recommend checking it out. Solid viewing.